10 YEARS !!! Yes !!! 10 Years ANNIVERSARY !!! 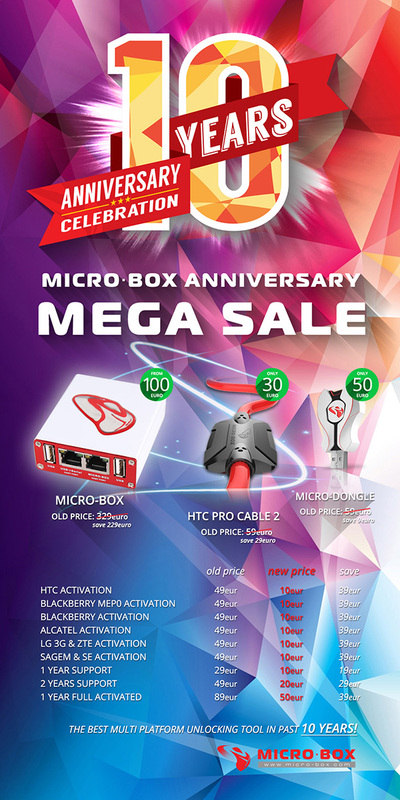 - News - MICRO BOX V3.0 THE BEST MULTI PLATFORM UNLOCKING TOOL ! 10 YEARS !!! Yes !!! 10 Years ANNIVERSARY !!! - 29.05.2016.
for our 10 YEARS ANNIVERSARY !!!! we will offer you the BEST PRICE EVER MADE ! 10 YEARS = 10 WEEKS OF PROMOTION ! !